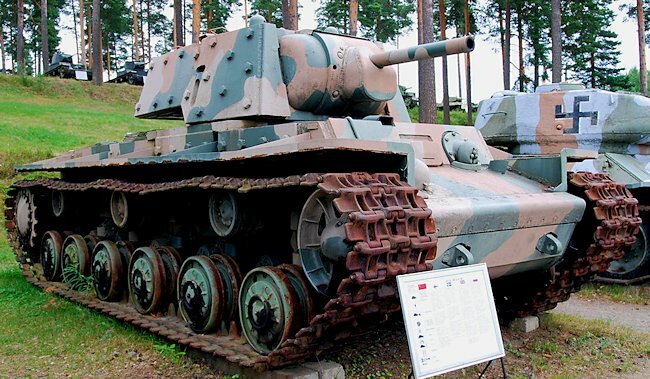 This Soviet KV-1 tank manufactured in June 1941 and captured by the Finnish troops in late 1941 can be seen in the Finnish Armour Museum in Parola, Finland. It has additional bolt on applique armour and was known as the Model 1940 'S Ekranami' which means 'with screens' and was given the designation KV-1E post war to differentiate it with the more numerous Model 1940 KV-1 tanks which the Germans called KV-1A. The Soviet Army only called it the KV-1 tank not the KV-1E. The addition of extra bolt on armour was a response to the new German long-barrelled 50 mm and 75 mm guns that were being fitted to German Panzer III and IV's. Both these KV-1 models had the same 76.2 mm F-32 main cannon. This is the only surviving KV-1E surviving example. It is painted in Finnish Army camouflage colours from the Continuation War. During 1938 a new heavy tank specification was laid down, and a heavy tank project was put forward by the group under Kotin. Two models were originally suggested, each having three turrets. Kotin took drawings of these tanks to Stalin, who was intensely interested, but suggested that one of the turrets should be removed and the saving in weight be used to increase the armour basis. Mostovenko wrote: Two heavy tanks were designed with shell-proof armour during 1938, initially intended to have three turrets; during the course of design work the number of turrets was reduced to two. The retention of several turrets was influenced by the old methods of design approach to heavy tanks, as well as to other fighting vehicles having several guns; this seemed justifiable in the case of heavy tanks with bullet-proof armour, but considerably increased the weight when employing shell-proof armour. Kotin revisited the Kremlin and showed Stalin further drawings of three new heavy tank projects; these included two twin-turreted concepts and one single turreted concept. Stalin was most impressed by the designs, particularly the single-turreted model, and requested that prototypes of all three should be constructed as soon as possible. Kotin undertook the construction of the two twin-turreted models, at the same time continuing design of the single-turreted tank. Rear KV-1 turret ball mounted machine gun. Notice how thick the bolted on side turret armour is and that none was added to the rear of the turret. The twin-turreted tanks so produced were designated T-1OO and SMK (Sergius Mironovitch Kirov) respectively, and were almost identical in appearance. Both had an upper central turret mounting a 76.2 mm gun, with all round traverse, and a lower, front turret mounting a 45 mm gun, with 1800 traverse. The chassis utilized a new torsion-bar suspension, with eight independently sprung, small-diameter bogie wheels on each side (with resilient, rubber-bushed hubs). The upper track was supported by four track-return rollers on each side. A new, very wide, cast track was used with heavily studded, small-pitch links. The tanks had crews of men and weighed 56 and 45 tons respectively. Both tanks were powered by 400 hp petrol engines. The armour, which was cast on both hulls and turrets, was designed to provide immunity to 37 mm AP shot at all ranges, and was up to 60 mm thick. Results from the combats in Finland, however, where small quantities of these tanks were used (hence the erroneous designation of T—35C adopted by the Germans), showed that the designs were not what was required in this tank class. 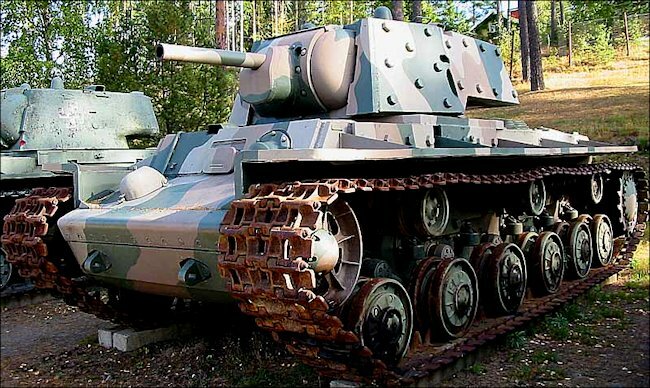 This is the only surviving WW2 KV-1 Soviet Heavy Tank. The Finnish Armour Museum should take more care of it. It is rusting and should be inside under cover from the harsh Finnish Winters. The birth of the KV-1. The problem was to increase armour and firepower without increasing the weight which would reduce mobility. 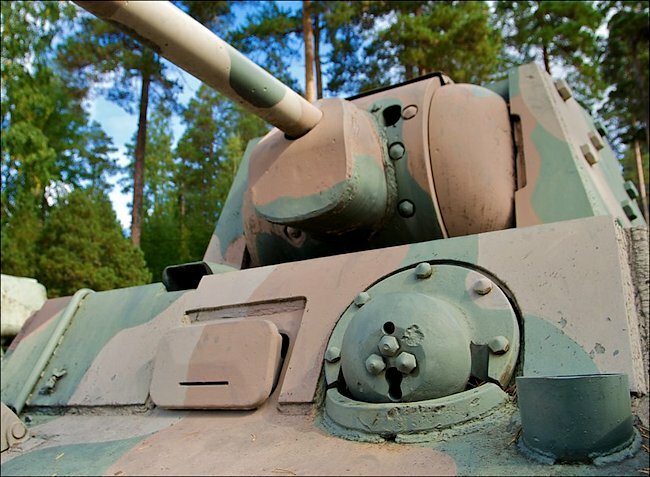 Thus, in the process of work on designing a heavy tank, the group of engineers (headed by Kotin) at Kirov came to the conclusion that a heavy tank with shell-proof armour should have only one turret and be armed with one very powerful gun. After completion of the single-turreted model, Kotin revisited the Kremlin where his heavy tank design was selected and renamed the KV (Klementy Voroshilov after the Russian commissar in charge of defence). Stalin approved the design except for the armoured skirting proposed for protecting the suspension; the Soviet tank designers wanted to retain this feature, but Stalin was emphatic and his will prevailed. A new form of torsion-bar suspension was developed for this vehicle. In September 1939 Kotin completed the prototype of the new KV, which Stalin accepted for production before the new suspension had been fully developed. Before large-scale production was undertaken, a limited number of these experimental heavy tanks were successfully employed along the Soviet-Finnish Front during December 1939. Production started in the same month at the Kirov tank plant, and the KV entered service proper during 1940. KV-1 Tank hull ball mounted and coaxial machine guns. Notice the driver has a periscope as well as a vision slit. An artillery version of the KV, designated KV-2 (also known as 'KV with big turret') was produced but was not tactically successful. Very early production models mounted a 122 mm howitzer, but later this was replaced by a 152 mm howitzer. The KV-1 (which initially became referred to as 'KV with small turret') took over the roles of both the T-28 medium and the T-35 heavy tanks. The Russians considered it to be the best tank in its class in the world at that time. This first model, the KV-1, was manufactured during late 1939 and early 1940 at the Kirov factory in Leningrad, and carried on the hull and superstructure up to 75 mm thick, turret was also on a 75 mm basis, but used heavier armour on the mantlet and turret front. 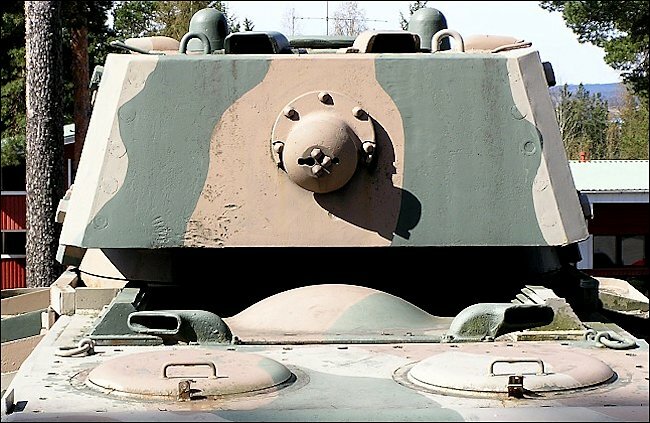 This massive armour was designed to provide immunity to artillery and anti-tank rounds up to 76 mm calibre at all ranges, The hull was welded, which greatly simplified manufacture. The armament on this first model consisted of a 76.2 mm M-1938/39 L/30.5 tank gun, the same as used on the early T-34 medium tank. The KV-1 inherited the steel-tyred resilient bogie wheels and wide tracks as developed for the SMK and T—IOO tanks, but had improved independent torsion-bar suspension. It also used an early version of the same 500 hp model V—2, V—12 diesel engine as used in the T—34 tank, which enabled it to move extremely fast, in spite of its excessive weight. Together with the KV—2 the KV—1 was successfully used during the breakthrough of the Mannerheim Line and as expected, the 75 mm armour reliably protected the tank from 37 mm anti-tank rounds. During 1940 243 KVs were built, and a further 393 during the first half of 1941. Both the KV—1 and the KV—2 were considered powerful breakthrough tanks. In 1941 the situation necessitated a bias towards the KV—I, and shortly after the beginning of the war production of the KV-2 stopped. The KV-1 was originally employed for the assault of fortified positions, and proved quite effective against the Germans during the early campaigns—although there were insufficient numbers to cause any great effect. The original KV—I had an angular turret of rolled plate with a pronounced rear overhang; this was suited to production in the older plants, and was eventually produced simultaneously with cast turrets. In addition to the 76-2 mm gun, the KV mounted three machine-guns, one to the right of the main armament, one in the right front of the hull, and one in the turret rear. The turret had two episcopes at the rear (one on each side), one for the driver, two gunners' periscopes, and a vision slit with a pistol port on both sides and in the rear of the turret. The general interior arrangement of the hull was practically identical to the T—34 in order to reduce problems in maintenance and resupply. The creation of the KV-1 determined the future development of the heavy tank by virtue of its unique combination of powerful armament and heavy armour. On 18 August 1941, so the story goes, one up-armoured KV-1 (the number 864, the commander was lt.Kolobanov) was dug in and camouflaged near Krasnogvardeysk town (Leningrad area). The tank had an order to defend the road from Kinigsep. Four more KVs were ordered to defense two other roads. All tanks got double ammo loads, 2/3 of rounds were armor piercing. An offensive of 8th German panzer division was expected. Kolobanaov's KV had great hidden position in the woods on the hill, the crossroad located down there between swamps. In the next day German motorcycle recon troops, the halftrack and one light track passed by road. Five minutes later the expected big tank column appeared and filled the road. The 1st Soviet round flamed the head tank, after two more shots the 2nd tank was flamed too. Then Kolobanov opened fire on column's tail and flamed the last tank: the Germans were locked. They even couldn't note Soviet tank and opened no-target-fire. Tried to run, some tanks were immobilized in the swamp. The chaos established on the road. Soviet tankers killed 22 German tanks during 30 minutes. Then the KV was spotted by the Germans and they opened aimed fire. In spite of impossibility of German tank guns to penetrate thick KV's armor, knocking rounds made terrible working conditions for Soviet crew. One of German rounds struck the turret ring and the KV was forced to leave its trench and maneuver by whole hull for aim a target. Then the Soviets noted two German towed guns appeared on the crossroad. The first shell disabled one gun, but another gun managed to do one shot and damaged KV's periscope (the loader Kiselkov replaced it nevertheless the enemy fire). Than that gun was destroyed too. Also ammo was almost out, and Kolobanov got congratulations via the radio and an order to go back. Already three another KVs were on the way to the battlefield. There were destroyed 43 German tanks, 19 guns, 11 halftracks. Kolobanov's tank got 135 hits, but no one penetration. Kolobanov was awarded with the Order of Lenin, Usov (gunner) with the Order of the Red Banner.